Also known as Pepsis Wasps, these insects deliver the most painful sting of any North American insect. 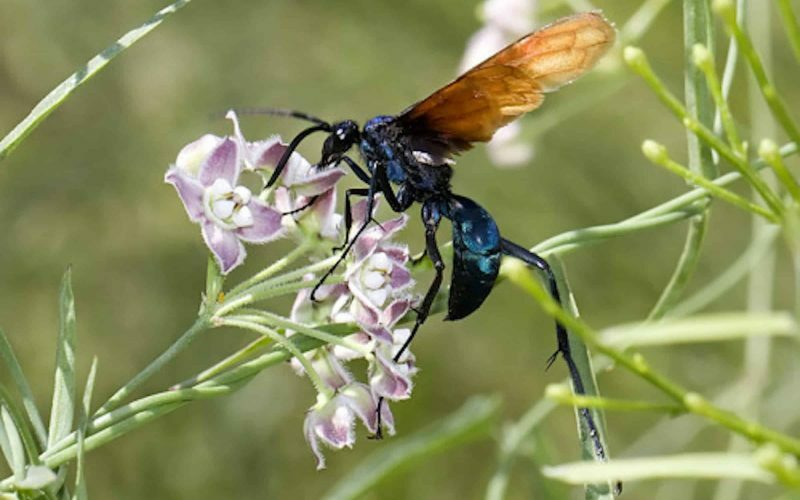 Tarantula Hawks are diurnal insects with a robust body that can be over two inches long and are blue-black in color. The wings are either bright orange or blue-black. Tarantula Hawks, also known as Pepsis Wasps, deliver the most painful sting of any North American insect. Fortunately they do not often sting humans. They are nectar feeders and are most active in the summer. During the summer months, a thorough observer will see one or more on most visits to Sabino Canyon. These giant blue-black wasps normally fly 4 to 10 feet in the air, occasionally landing and searching the ground for their prey, the tarantula. During the summer, the female wasp hunts a tarantula spider, and after a battle, injects paralyzing venom. The limp but living spider is then dragged into a burrow. She places the spider in the burrow and lays one egg on it. The larva hatches in 3 to 4 days and attaches to the spider abdomen with its sharp mandibles. It feeds on liquids from the tarantula for its first four growth stages. In its fifth stage, the larva chews into the tarantula and consumes much of the innards, killing the spider. The larva, now more than two inches long, spins a cocoon and pupates inside. This underground drama requires 250 to 350 days and culminates in the new wasp finally digging out of the burrow in the springtime to complete the life cycle.